Embark on a mission into the hidden tombs of the ancient pyramids as a female explorer searching to uncover ancient artefacts and the secrets of Tutankhamun. This video slot is a modern and refreshing 5 reel online slots games that allows you to spin through reels filled with hieroglyphic letters and multiple paylines that reward you with the secrets of ancient Egypt and everyone’s favourite, free spins. To see similar games then click here . Playson is a fairly new face to the online gambling industry. Established in 2012, already they have over 250 staff worldwide and 30 high definition online slot games in their portfolio. Their online casino games integrate skill and social media along with high definition graphics and technological innovations, making them a favourite choice amongst gamblers. With many more high-quality games in the pipeline, Playson has established itself as a development company worth looking out for. 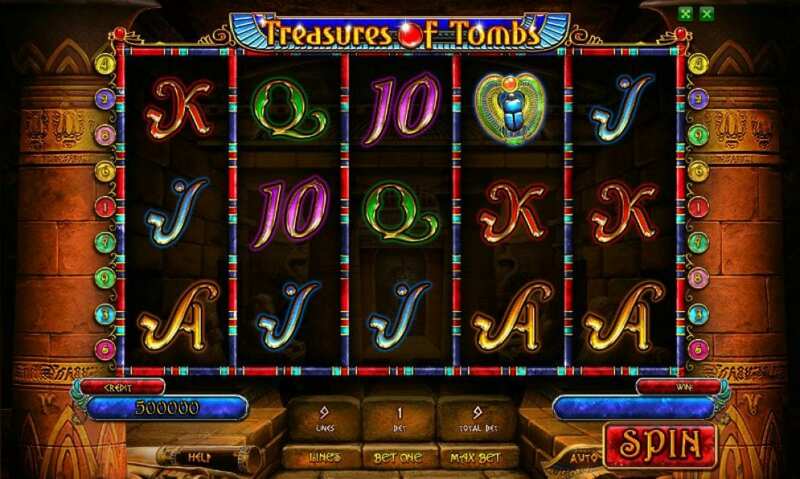 Treasure of Tombs is an online slot game that will appeal to anyone with a sense of adventure. If you have ever wanted to explore the tombs of the Ancient Kings of the Pharaohs but just cannot seem to get yourself away from your day job then this game will take you on a trip you will never forget. 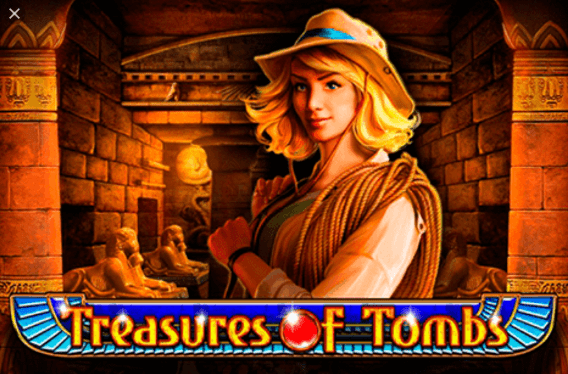 Follow the beautiful girl-archaeologist through this online slot game with 5 reels, 3 rows and 9 paylines. Bets can be set at 27p up to £45 per spin. Treasure of Thombs is set inside a pyramid with beautifully decorated stone walls and gold hieroglyphs and an enchanting soundtrack to get you into the mood for adventure. As you would expect from an Egyptian themed game, you also have some beautiful symbols ranging in pay value. You have your standard playing card letters, scarab beetles, Horus (the God with a falcon head), the mysterious Sphynx, the Eye of Ra and the girl-archaeologist. The Wild symbol in this game is the Eye of Ra symbol, this Wild will substitute all symbols on the reels. It also acts as the Scatter in this game, if you can get 3 or more anywhere on the reels this will trigger the Free Spins feature where you will get 10 free spins. If you can get 3 Eye of Ra symbols during a Free Spin game you will win an additional 10 Free Spins. This means you could get a total of 20 Free Spins! The girl-archaeologist is the most valuable symbol as will reward you with a multiplier of 555x times your total stakes for 5 paylines. You also have 1 symbol which is randomly selected before your Free Spins start. This can be any symbol on the reels except the Eye of Ra. This bonus symbol will give you pay outs even if it doesn’t appear on successive reels. If you can get 5 Horus symbols across a payline he will give you a multiplier of 2,000x your stake, but the most generous symbol is again the beautiful girl-archaeologist. If you can get 5 of her on a payline she will reward you with an impressive 5,000x your bet. Treasure of Tombs lives up to its name, even the simple letter symbols look as if they are made out of precious gold and gems. Visually this is beautifully animated online slot game with exceptional graphics setting it above other Egyptian themed games you may have come across before. While this game is simple to play, it make take you a while to hit the Free Spins feature but with such impressive pay outs it will be worth the effort. So pack your pickaxe and follow the girl-archaeologist as you descend into the tombs of ancient kings, there is many, many treasures to be found in this game. Discover more games in our homepage.